Blockchain is an undeniably strong force, it cannot be missed, it is the future, some might say it is the fourth Industrial revolution. This revolution is not going to happen but it is happening as we speak! The World Economic Forum (WEF) states that we have already entered the transition phase into a new economic, political and societal era. The technologies that are present in this phase are still in their infancy but will be a driving force for a new way of living and are here to stay. Blockchain has created a massive turning point already in the economic sphere, in relation to crypto-currency and businesses who decide to integrate blockchain into their work. Besides Blockchain, there are also 2 other disruptive technologies which are; Artificial Intelligence (AI) which has been progressing rapidly in our social lives and also the notion of the Internet of Things (IoT) which I will be discussing further on. In this article I will be talking about the evident importance of Blockchain in relation to it being a disruptive technology and also talking about the 2 other disruptive technologies and how they coagulate together to form a sort of trinity with which will be a driving force for a future living. 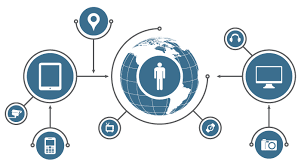 The internet of things (IoT) is the notion that discusses how as the years go by, more and more of the devices we buy can be fully connected to the internet and to each other. The internet of things talks about how devices can now communicate with each other, sending instructions and activity data back and forth. The Internet of Things could theoretically blend digital and physical machinery to create a more efficient and ultimately smarter product. The acceleration of IoT devices was seen in 2018 when a lot of business adopted IoT platforms across businesses. Governments and businesses are investing heavily in smart manufacturing because of its use and it being so helpful and efficient. We can see how this disruptive technology is and will affect us in the future. We have never been closer to technology than we are at this point! The goal of AI is to ultimately create a machine that is able to think freely, independent of any human which will help and serve us for work and even everyday life. A machine that is able to process real-time information and decide on its own. The ability to automate business can make businesses more efficient, it may help to redefine and reinvent the customer experience, and help you in your everyday house needs. These are only a few potential uses of AI and it can cover anything from management, catering, retail, cybersecurity and many more. AI will also change data analytics, this is done by having them learn from past analytical tasks, data taken from previous problems and previous machines. Machine learning is the core idea for AI to progress the machine itself and in turn the technology. When discussing business, AI is useful in many areas, a very important area is the ability to automate, this reduces the need for extra workers and human errors will be completely removed. Other than this, AI may also be able to prevent and predict future problems and situations that a company might reach. When discussing disruptive technologies, Blockchain is an essential cog in the trinity of disruptive technologies. While AI and IoT technologies gather the data, blockchain represents a new way of storing data and sharing data. Blockchain uses cryptographic hashing to encrypt data in order to provide security to ordinary computer privacy systems. Blockchain also helps to make transactions more secure and immutable than the current internet. Blockchain also makes transactions private, this works due to the decentralised mode of transactions that blockchain is built upon. Data is stored on participating nodes/computers that live across the blockchain network. The opposite of the decentralised network is a centralised network which banks and governments use. Decentralisation pushes away any agenda that companies and banks might have since it is not corporately owned. These 3 technologies of Blockchain, IoT and AI all work together to help each other and make each other smarter. The integration and interoperability of these 3 are becoming high priority for developers and business owners. The 3 technologies will eventually start running our lives due to the attention they are garnering and the already known importance they have. We need to keep updated on the progress of these technologies and not be left behind, especially business owners who are looking for innovation and expansion. People must be aware of the progress of these 3. We are the in revolution of Blockchain, Artificial Intelligence and the Internet of things, we have experienced the birth now we are experiencing the growth of these 3 and this trinity will define the way we live at home, we travel, sell, store data, education and every area that technology touches which is practically everywhere! The automation and digitisation of the world is happening and we either accept it or be left behind. This trinity is going to change everything and the way we can make the utmost of it is by learning and being smart about the capabilities of technologies are. Our mission is to guide you through the complex process of understanding cryptocurrency and Distributed Ledger Technologies in the most practical way – leaving you with a clear understanding of the market and helping you to take the first steps. Megan was born in Poland but from a young age always sought to expand her horizons to a more cosmopolitan way of life. At 19 she moved to the hub of tech and culture where she studied at City University in London. Keen on understanding media platforms and social interaction Megan graduated with a degree in Media and Sociology. Looking forward Megan began to invest both her time and money into new industries and one, in particular, got her attention: Blockchain. Megan would absorb all that she could and back in 2010 the blockchain market was more of a pipe dream than the business tycoon that it has evolved to be today. Her young mind began to wonder where she could further her Cryptocurrency ventures and a little island in the middle of the Mediterranean seemed like the perfect spot. While London gave her the grit and business foundation she needed, Malta was the next chapter and a flourishing island to home Blockchain. Megan found the perfect balance with advanced finance technologies and routinely studying the market in which it lives. BiteMyCoin is the result of Megan’s cryptocurrency passion and with every post, update and new piece the aim is to bring the reader one step closer to our future. After completing his degree in advanced character animation in California, he identified, together with his brother Zak, a niche in Malta’s market for a data-driven digital marketing agency – and the rest is history. A serial entrepreneur by nature, when he’s not pushing the boundaries on innovation and setting up new start-ups, Benji loves reading, observing people and enjoying the simple things in life. He’s an avid windsurfer, who has sailed semi-professionally since the age of 13 – but there’s nothing he loves more than spending time with his family, friends and his girlfriend. Zak takes care of the business side of things. He leads the business development and international growth of the agency. After completing his Masters of Engineering in Software Engineering for Embedded systems from Fraunhofer IESE, he teamed up with his brother Benji to set the foundation for ANCHOVY. Zak has a passion for the sea, and if he’s not at the office he’s driving his passion for long distance swimming, sailing and windsurfing.